Youth soccer is something that happens all year long for many Wood River Valley families, so summer soccer camps fit the bill. “Always training,” is a motto of one of the best, which is called One.Soccer School. The company has camps for all ages around the country, from California to Colorado, Florida, Georgia and Utah. One.Soccer School returns to Hailey’s Wood River Middle School fields for half- and full-day camps during the week of July 21-25. Returning to the valley for the ninth year, the local camps are based on age levels—ages 10-18, another for juniors ages 6-9 and, new this year, the “Jett” camp for ages 3-5. Field Level Premier and Goalkeeper Premier camps for ages 10-18 teach the “Fail Your Way to Success Philosophy,” where mistakes are signposts on the way to success. Young players get up to 40 hours of training to lay the foundation for taking their games to the next level. Goalkeeper Premier breaks down each aspect of the vital spot. Exercise drills are used to improve flexibility and coordination in a soccer specific way. Youngsters are also trained in speed, agility and quickness. Teaching sessions include passing and receiving, dribbling, turning and tactics. 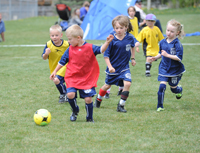 The intensive five-day camps for boys and girls ages 10-18 are from 8 a.m. to 4 p.m. Monday through Thursday, and 8-12 Friday on the north Hailey soccer pitch. Cost is $319 for 40 hours of training (rising to $349 if paid after June 1). Parents are encouraged to come out Friday morning, bring their cameras and watch the foot volley and 5v5 tournaments that wrap up the camp before the closing ceremony. Occurring at the same site and during the same times as the full-day position camp is Goalkeeper Camp. It’s a five-day camp that helps developing goalkeepers with technical and tactical aspects of the position—dealing with crosses and breakaways, distribution and shot stopping. Age range is 10-18. Cost is the same, $319 by June 1, $349 after. Also offered is the Junior Camp for coed players ages 6-9. Hours are 8 a.m. to noon Monday through Friday. Tuition is $209 if paid by June 1 and $219 after. Junior Camp tries for a fun environment while teaching the core technical skills needed to play soccer. Four skills challenges bring together the physical and technical aspects. Friday morning tournaments are played, and the young kids receive a certificate of completion. All players receive a uniform and game-quality ball. For registration visit onesoccerschools.com. Group discounts are available. l Another One. Soccer School positional camp for ages 10-18, this one a half-day camp that is run through the Community School summer program July 28-Aug. 1 at Sagewillow Farms in Sun Valley.